Not far south is the town of Tully is the sugar-mill town of Tully. 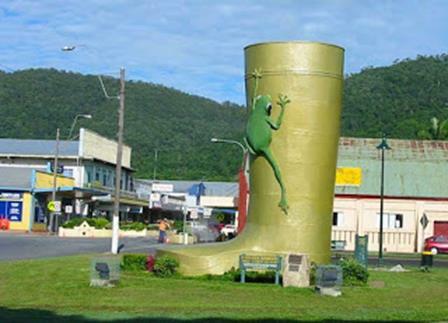 The big golden gumboot at the town entrance proudly boasts that it is the wettest place in Australia. The upside to this is that it’s a great place to experience white water rafting in the nearby Tully River. 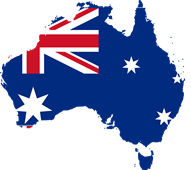 It’s also just a short drive to beautiful Mission Beach where the World Heritage rainforest meets the Coral Sea in a 14km stretch of palm-fringed inlets and beaches. 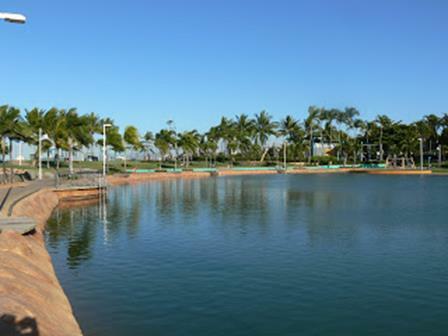 Aside from hiking and various water sports, it’s also one of the closest access points to the Great Barrier Reef. So we’d love to have stayed a day or two but we were on a schedule and had to keep moving. The city of Townsville would be the ideal place to stop for lunch and more fuel. We decided it would be a great idea to eat our sandwiches on the landscaped waterfront esplanade. It’d be the last that we’d see of the ocean for quite some time!